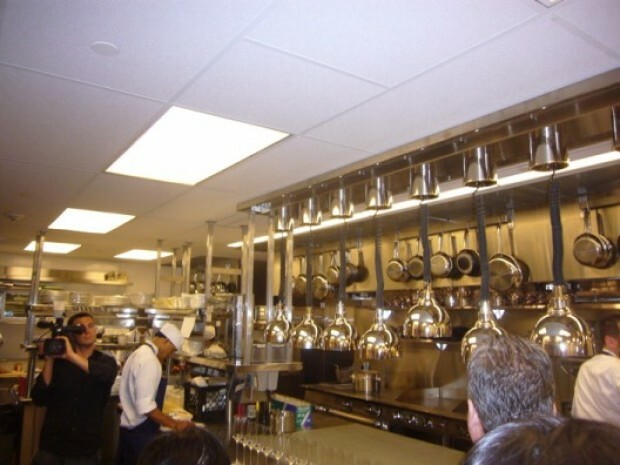 Bryant Park: Yesterday afternoon Charlie Palmer, his PR and design team, and chef Christopher Lee gave a tour of the new location of Aureole, located at One Bryant Park. Though there is a lot of work that still needs to be done, the place should be ready to go when they launch their first set of preview parties next week, and when they open to the public (hopefully) at the end of the month. They're now taking reservations for the month of July at 212-319-1660. Here's how it breaks down. The restaurant is divided into a bar (18 seats), a bar room overlooked by a giant wine mezzanine (64 seats) a dining room (56 seats), a private event space (60 seats), and an outdoor seating area in the alley between 42nd and 43rd Streets (13 seats). Lee will offer up a menu of snacks at the bar, an a la carte bar room menu, and a prix fixe dinner menu for the dining room. While he and his team have been working for five months to create the menu, it shouldn't be too much different from what's currently served at Aureole—or from what Lee was doing back at Gilt. Things to look forward to: pork belly and pastrami sliders, sashimi, ceviche, and and lobster tail paired with pork belly. Today, the first day the stoves were turned on after getting gas, dozens of chefs worked frantically to practice for next week. The space itself, designed by Adam Tihany (La Fonda del Sol, Daniel) is billed as being a "throwback to the townhouse intimacy of the original Aureole," but it in fact quite a departure from the old UES space. It's bright, it's open, it's modern, and it definitely has the feel that it's in a shiny new office building (Bank of America). One highlight: that mezzanine above will be temp controlled and will hold 3,500 of the restaurant's 15,000 bottles of wine. Stay tuned for more once the restaurant enters preview mode.